Community life engagement refers to all the ways that people with intellectual and developmental disabilities access and participate in their communities outside of employment. Activities can include volunteer work; postsecondary, adult, or continuing education; accessing community facilities such as the library, gym, or recreation center; any activities that people with and without disabilities do in their spare time. CLE activities may support career exploration , wrap around work time, or serve as a retirement option. ICI is conducting research on CLE to develop guidance for states and service providers on how to improve CLE supports while maintaining a focus on Employment First. 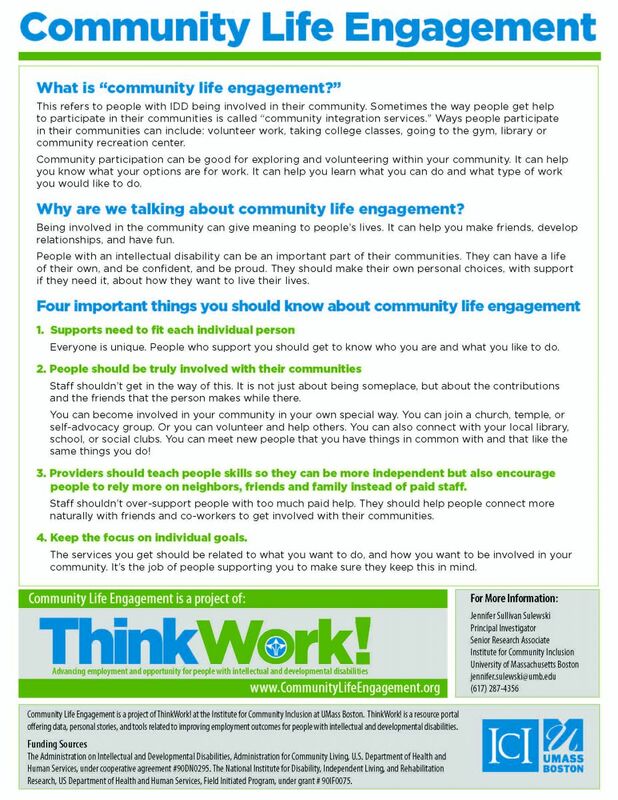 This one-page, accessible flyer provides a plain language overview of the definition of Community Life Engagement, and the four most important things to consider. These brief products describe findings and insights from our ongoing research on CLE, including description of the four CLE Guideposts and how they are put in practice at case study sites. Read the series here: Community Life Engagement Engage Series. A collaborative effort with the Access to Integrated Employment project , these publications highlight service provider practices that enhance CLE for people with IDD while maintaining a focus on employment. Read the Access to Integrated Employment and Community Life Engagement Promising Practices series here. Look here for past presentations from the Community Life Engagement. Engaging with State Employment Leadership Network to identify emerging needs and issues at the state level. Conducting interviews with 13 knowledgeable people representing state IDD agencies, service providers, researchers, family members, and individuals with IDD. Conducting case studies of Community Life Engagement efforts at three exemplary service providers. Developing a promising practices series on state and service provider implementation of Community Life Engagement. Surveying state IDD agencies about their Community Life Engagement policies and practices. Developing, piloting, refining, and disseminating guideposts and toolkits for states and service providers. Sulewski, J.S. (2014, November). Community Life Engagement: A New Initiative of the Institute for Community Inclusion and State Employment Leadership Network. Poster presentation at the annual meeting of the Association of University Centers on Disabilities, Washington, DC. Sulewski, J. S. (2010). In search of meaningful daytimes: Case studies of community-based nonwork supports. Research and Practice for Persons with Severe Disabilities, 35(1–2), 39–54. Sulewski, J. S., Butterworth, J., & Gilmore, D. S. (2008). Community-based non-work supports: Findings from the National Survey of Day and Employment Programs for People with Developmental Disabilities.Intellectual and Developmental Disabilities, 46(6), 456–467. Sulewski, J. S., Butterworth, J., & Gilmore, D.S. (2006). Community-based non-work services: Findings from the National Survey of Day and Employment Programs for People with Developmental Disabilities.Research to Practice Brief. Boston, MA: University of Massachusetts Boston, Institute for Community Inclusion. Sullivan, J. A., Boeltzig, H., Metzel, D. S., Butterworth, J., & Gilmore, D. S. (2004). The National Survey of Community Rehabilitation Providers, FY2002-2003. Report 2: Non-work services. Research to Practice Brief. Boston, MA: University of Massachusetts Boston, Institute for Community Inclusion.